The 42-year-old actor’s lifeless body was discovered on May 26 by ex-wife Shannon Price – who he was dating again and believed to be on the verge of remarrying – after he experienced a fall at his home. Police do not believe his death was suspicious and Shannon, 24, made the decision to turn off the life support machine after doctors warned her he would never recover. Gary’s longtime friend and former manager Dion Mial is due to take the copy of the latest will – where he is named as the executor – to Utah county court this week. Until then, funeral plans have been put on hold. Sue and Willie – who had not been in contact with Gary for years – revealed they wanted their son to finally be laid to rest soon. Their lawyer Frederick Jackson said: "From the start, Mr. and Mrs. Coleman’s intention has been to see that Gary’s wishes be honoured and that his affairs be taken care of properly. They wanted to do things the right way, and they urge those still involved to do the same. The Colemans ask that everyone please treat Gary with respect and kindness. They feel it is time for him to find peace and let his spirit go." Gary Coleman Cited for Disorderly Conduct in Parking Lot Spat! 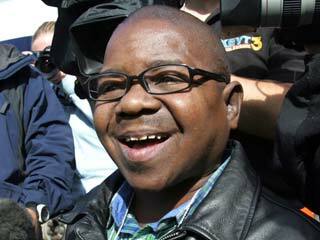 Gary Coleman Crazy Celeb Or Victim Of Over Zealous Fan?